So with the scrappy trip along came instagram. If you wanted to view my contributions I am "shecanquilt" there, also I am "shecanquilt" on twitter although I have yet to tweet much. This weekend I seem to be learning social networking, along with how to make soup. I am still not at all sure what instagram really is all about but I only have 16 followers there so I don't think I can mess up that much. I am also admiring this beauty. Katy from the Littlest Thistle sent it to me because I won her giveaway. I met Katy in London, she brought me her extra sewing machine something like 450 miles so I could use it at the retreat. Besides being incredibly generous and helpful, Katy is a capable woman - she even knew where to find the most amazing cupcakes while we were in London. I have to show you the details. The mittens are adorable. And look at that cute button on the hat. Thank you Katie, this is just perfect. 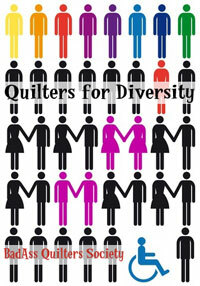 It is going on my wall where I sew, which is also where I sleep, so I will see it every day. Today I got to make a secret project, so I am just showing you a very colourful sneaky peak. I never get to make secret things, but now I have one. I get to share it with you later this month. That is the Free Bee bee block for my friend Marianne who blogs at The Quilting Edge. 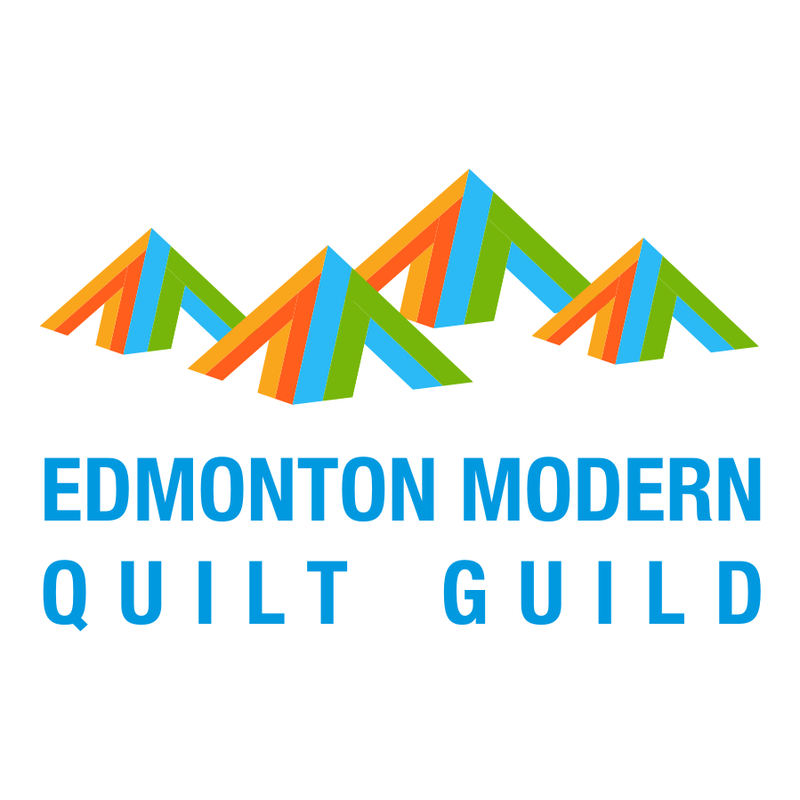 She is an awesome quilter and I get to have lunch with her in real life from time to time, so I was really worried about letting her down. The assignment was to be inspired by urban architecture and images and also Elizabeth Barton. So this is my impression of the City Hall in my city - which is a stunning building - and Elizabeth Barton style night sky and reflections - there is a pond in front of the building which reflects it. It is made with many Oakshott shot cottons, including some of my leftover liparis. Marianne said she likes it, so now I am all caught up with my bee blocks. 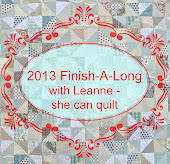 I have also been reading the tutorials that Rhonda at Quilter in the Gap has been hosting for the wrap up of the 2012 FAL. I have been seeking sponsors and tutorial writers for the 2013 FAL and I am learning how to host a linky party. We have some great sponsors and tutorials coming and I am still looking for more too. I hope you will be joining me, the 2013 FAL fun starts on Monday. And don't worry, the link to post those projects you intend to finish will be open for a whole week. That's what I have been doing. How about you, whatchadoing? wow, Leanne. That's lots and lots of gorgeous projects!!!! Love Katy's mini, too. Loving the trip along. So great to use those scraps! oh wow - lots going on for you! Your scrappy blocks look wonderful - I'm anxious to do more, but 1)cleaned my sewing room up today so I could see what needed to go on my FAL list and 2) made more blocks for my major wip - the mod crosses....hoping to finish those tomorrow and start sewing rows together!! I have been following the trip along in twitter-its something I would definitely like to do, but I just can't at the moment. That bee block is brilliant! But I will not be joining the scrappy QAL. I may be the only one resisting but resist I will. wow love your bee block! so pleased you couldn't resist the scrappytrip, its a barrel load of fun, now I'm sewing binding on mine I can get on with all the other stuff I should have been doing! lol its that addictive! Loads more to do now, so first up, FAL list! You bee block is amazing - wow! Can't wait to see the secret project and the rest of your tripalong! Sounds like you have a lot going on, Leanne! IG is fun and I'm sure you'll have many more followers now. Your scrappy trip is looking great, and the bee block is fabulous! Today I am making soup, gathering UFO photos, doing a puzzle, and watching movies. Lazy day! Right now I'm working from home, doing research. I am amazed by your energy! Looking at your mosaic from last year really brought back memories of reading (loving!) your blog. 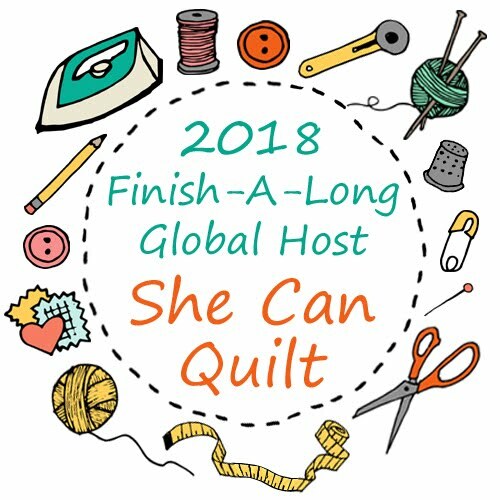 I will be attending Quilt con and look forward to seeing Shattered in person. Why am I not following you on IG - off to remedy that now. IG is great! I haven't been doing any sewing but I have my machine back so I see sewing in my very immediate future...lovely makes as always Leanne! Your mini from Katy is so darn cute. She did a beautiful job with the details. I also think the bee block is great. I'm glad you are trippin' with us. You will find Instagram can be quite addicting. I think I blog less, which is ok with me. 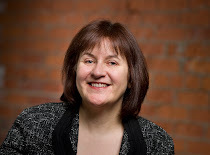 Just discovered your blog--awesome! and I cannot believe the gorgeous seam ripper! I would die for one of those! Thanks for the chance to do so.